The Earth is facing an imminent risk of crossing tipping points in Earth’s life support systems. When that happens, self-reinforcing cycles will kick in that could potentially lead to a ‘hothouse Earth’ state. Yet we still have an opportunity to keep global temperatures in check. To accomplish this, greenhouse gas emissions need to peak by 2020 and then fall dramatically – approximately by half every decade. We call this the Carbon Law. Solutions already exist in energy, industry, buildings, transport, food, forestry and agriculture. The gap between science and understanding in society has essentially closed. Now we need to close the gap between understanding and acting. Now is not the time for incremental improvements - we need rapid scaling and exponential climate action. Connectivity will be a key enabler for many, if not most, exponential climate solutions. The recently-launched Exponential Climate Action Roadmap explores how the Carbon Law can be implemented across all key sectors of the global economy. In this report, we argue the digital technology sector is probably the world’s most powerful influencer to accelerate action to stabilize global temperatures well below 2°C. The digital sector is already well on track to reduce its own emissions, which represent 1.4% of the global total, and it has the opportunity to cut global emissions in half by 2030 while driving exponential growth in data performance. The digital sector can also take a strong lead in accelerating demand for 100% renewable energy. 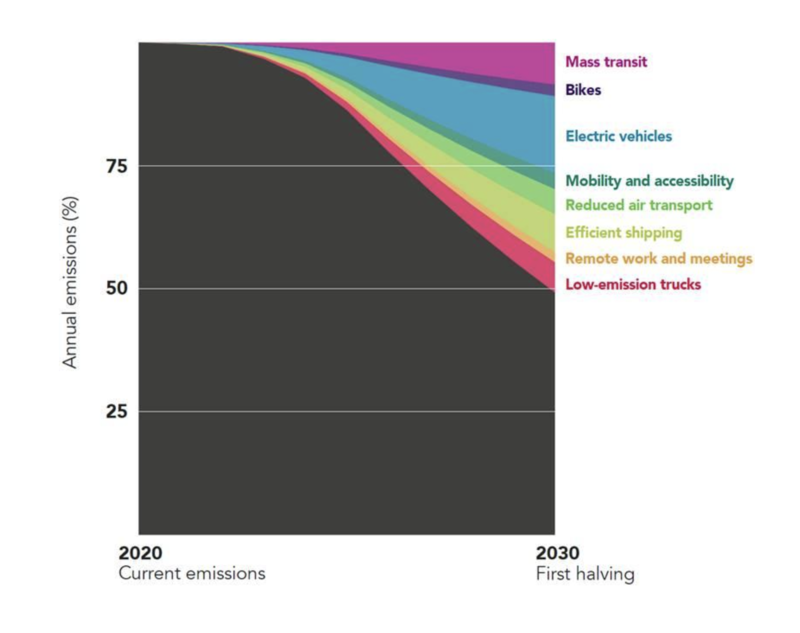 Our assessment, as laid out in the Exponential Climate Action Roadmap, is that digital technologies could already help reduce global carbon emissions by up to 15% – or one-third of the 50% reduction required by 2030 – through solutions in energy, manufacturing, agriculture and land use, buildings, services, transportation and traffic management. This corresponds to more than the current carbon footprints of the EU and the US combined. But it is through the Fourth Industrial Revolution – particularly 5G, the Internet of Things (IoT) and artificial intelligence (AI) – that the digital sector can take the pace of change to the next level. Exponential technologies are those whose output per size or dollar is consistently accelerating. The classic example is the silicon chip – since the mid-1960s, the power of computer chips has doubled every 18-24 months while the price has halved (following Moore´s Law, which inspired the Carbon Law). 5G is the next exponential technology. With data speeds 10 to 100 times faster than 4G, it represents a step-change in mobile technology. But the benefits of 5G go far beyond speed. Its capabilities include super low latency, better reliability, tighter security and lower energy consumption. In the latest Ericsson Mobility Report, Ericsson estimates that the number of cellular connections will reach 4.1 billion by 2024, which is double previous estimates. With sensors in factories, in smart cities, on farms and in our homes, 5G combined with AI has the potential to make our societies and economies radically more efficient and sustainable. To illustrate this, let’s focus on one of the industries highlighted in the roadmap: the transport industry. Transport accounts for 21% of global emissions, with 73% coming from short journeys. Several technologies are now converging that will ensure the transport sector undergoes its most dramatic transformation in a century. In the last two years, all major car and truck manufacturers have announced electrification plans. In China, Shenzhen´s bus fleet of 16,000 buses is completely electric and taxis are planned to follow. But the real game-changer will be electric and driverless cars and trucks. 5G is a pivotal technology for safety, efficiency and reliability in this space. Driverless vehicles will accelerate a shift in the traditional business model of vehicle ownership towards mobility and transportation as a service. This means fewer people will own a car, instead ordering shared rides from driverless electric vehicles or catching a driverless bus. Within industry, Ericsson, Telia and Einride are working on a connectivity-based 5G solution that could lead to an exponential transformation of short-distance transport on public roads. The project is based on Einride’s T-pod, a continuously operating driverless vehicle, and aims to make all road freight transportation electric. Such a sustainable and cost-competitive solution may replace more than 60% of today’s transport impact. Einride estimates the CO2 reduction potential per pallet of freight when transitioning from diesel to electricity to be 90% for countries with a low-carbon electricity mix, like Sweden. It will also reduce emissions of harmful NOx and ultrafine soot particles. Who will pay for the vast 5G networks driverless cars will need? What are the next exponential technologies? 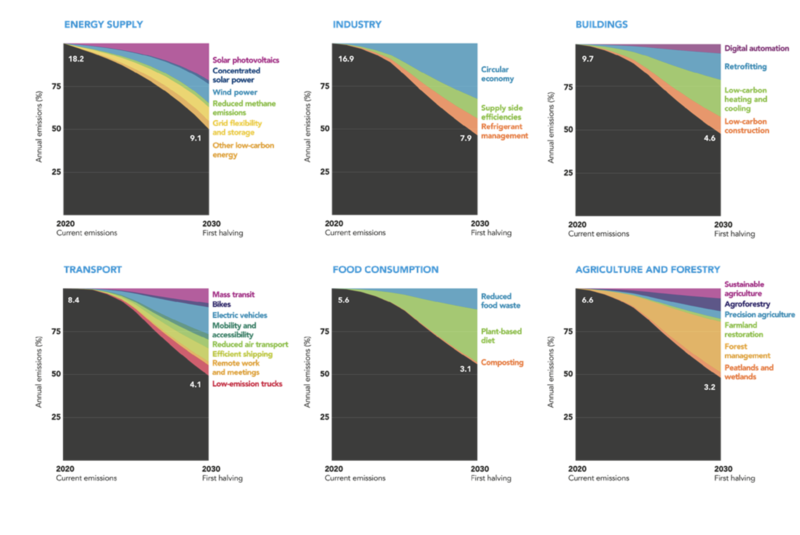 To halve emissions by 2030, we need to maximize technologies at different levels of development. Cloud computing, first-generation industrial automation and 3G and 4G mobile networks, among others, already serve as a foundation for big efficiency gains. Next come 5G, AI, IoT and drones, which all depend on connectivity and open up completely new opportunities. With the right policy frameworks and strong climate leadership, these technologies will be instrumental to moving society towards a circular and lean economy, focused on growing service value while reducing waste and pollution. Taken together, this will require nothing short of a global economic transformation and climate leadership at all levels from cities, countries and corporations. Digitalization is already transforming the global economy and unleashing powerful forces in every industry. We have growing evidence that exponential innovations in both infotech and biotech, as we enter deeper into the Fourth Industrial Revolution, have the potential to realise a sustainable and wealthier future for all. The grand challenge for humanity is to ensure that groundbreaking technologies have a clear purpose for our planet and everyone on it. If we adopt an integrated framework for sustainable innovation within planetary boundaries for the people and planet, and harness these forces, we can build exponential momentum and make the Carbon Law a reality.